Living in the Hell's Kitchen neighbourhood of New York City, Matt Murdock is blinded by a radioactive substance that falls from an oncoming vehicle. While he no longer can see, the radioactive exposure heightens his remaining senses beyond normal human ability. His father, a boxer named Jack Murdock, supports him as he grows up, though Jack is later killed by gangsters after refusing to throw a fight. 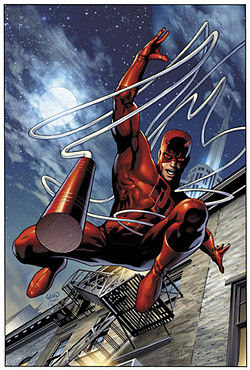 After donning a yellow and black, and later a dark red, costume, Matt seeks out revenge against his father's killers as the superhero Daredevil, fighting against his many enemies including Bullseye and the Kingpin. Daredevil's nickname is "the Man Without Fear.